Rocky River Zip Line and Adventure Park, a proposed aerial adventure operation in Colinet, New Labrador in Canada, is one step closer to reality. Cameron Annas, vice president of Granite Insurance, has been elected by the general membership to the Association for Challenge Course Technology (ACCT) board of directors. Brandauer GmbH, manufacturer of the Brandauer Mountain Coaster, has become part of Sunkidworld. Royal Gorge Bridge and Park is hoping to add a via ferrata attraction, allowing guests to scale the granite walls of its namesake gorge. Jan 10 How Sound is the State of the Industry? 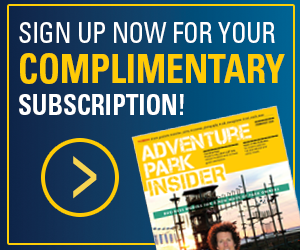 Adventure Park Insider will present information and analysis from the State of the Industry Report in a seminar at the ACCT Conference in Denver. Will the ASTM F2959 standard expand to include more traditional operations and programs? Registration is open for the 16th annual Professional Ropes Course Association (PRCA) Conference and Expo. The event will take place March 7-10, 2019, at the Holiday Inn Tampa Westshore in Tampa, Fla. The TreeUmph! Adventure Park in Brooksville, Fla., was auctioned off in late 2018 to Canadian businessman Albert Barbusci. Two people were injured in separate incidents during the soft opening of the Fly LINQ zip line at the Linq Promenade on the Las Vegas Strip in early November.